The Koenigsegg Agera is a mid-engined sports car made by Swedish car manufacturer Koenigsegg as of 2011. It is a successor to the KoenigseggCCX/CCXR. The name Agera comes from the Swedish verb 'agera' which means "to act” or "to take action". It was named Hypercar of the Year in 2010 by Top Gear Magazine. In early development the car was fitted with a 4.7-litre V8 engine with twin fixed-vane turbos, but it was replaced with a 5.0-litre twin-turbocharged V8 engine for the production version of the car. The Agera is powered by an in-house developed 5.0-litre twin-turbocharged V8 engine which produces 940 hp (701 kW) at 6900 rpm and 1,100 Nm (810 lbft) of torque at 4000 rpm. Total weight of the engine is only 197 kg (434 lb) thanks to a carbon fiber intake manifold and the aluminium construction. The transmission is a 7-speed dual clutch with paddle shifters. It is the first dual clutch transmission to feature only one input shaft. The second clutch slows down the input shaft during up shifts in order to reduce the time it takes to synchronize the next gear, resulting in faster shift times. Most notably, the transmission weighs only 81 kg (179 lb). Top speed for the production model is above 420 km/h. The Agera has a body made from pre-impregnated carbon fiber/kevlar with lightweight reinforcements. The car's hardtop roof is stowable under the front hood lid. The chassis is also made out of carbon fiber with an aluminum honeycomb that comes with integrated fuel tanks for optimal weight distribution and safety. The rear wing is electronically adjustable with auto setting or manual control in order to have as little compromise as possible between low drag and down force, depending on situation and mood. The Agera comes with forged aluminum wheels with center locking nuts, measuring 19" on the front and 20" on the back and wrapped in a set of Michelin Super Sport tires that can be used with speeds of up to 420 km/h (260 mph). Other highlights include the trademark Koenigsegg doors, a new traction control system, LED lighting, blue hood stripes that continue on through the cockpit of the car and a custom interior with a new “Ghost light” lighting system, which uses carbon nanotubes in a unique configuration to shine through the car's aluminum buttons. The Agera R made its debut at the March 2011 Geneva Motor Show—with a Speed Racer livery theme, special Michelin tires and a Thule Rt. It can accelerate from 0–100 km/h (62 mph) in 2.9 seconds and reach a theoretical top speed of 440km/h (273 mph). The Agera R has a drag coefficient of Cd=0.37, or Cd=0.33 at high speed due to its adaptive rear wing, while producing 300 kg of downforce at 250 km/h. This adaptive rear wing system is lighter than conventional hydraulic/electrical adaptive systems, and has the unique ability to compensate for head/tailwind due to its spring loaded design. Furthermore, the pylons holding the wing play not only a role in the Agera R's aerodynamic performance, but also assist in extracting hot air from the engine bay. On 2 September 2011, during test sessions in Ängelholm, the Agera R broke six world land speed records for a production car, including 0–300 km/h in 14.53 seconds, and 0-300-0 km/h in only 21.19 seconds, a record yet to be broken. The braking performance required to maintain this record is enabled in part by the Agera's stability, demonstrated by Koenigsegg's test driver and drivetrain technician Robert Serwanski, who was recorded by passenger Rob Ferretti (founder of the group "Super Speeders") braking from 186 mph to 0 without holding the steering wheel. The Agera R can produce lateral cornering forces of 1.5G, due to a combination of mechanical balance and high levels of grip from the specially developed Michelin Supersport tyres. The 2013 version of Agera R premiered at the 2012 Geneva Motor Show. Upgrades included carbon fiber wheels, enhanced aerodynamics, and engine upgrades allowing the Agera R's 5 litre twin turbocharged engine to produce 1140 hp on E85. And, thanks to Koenigsegg's Flex Fuel Sensor technology, the ECU can respond to varying fuel qualities and alcohol content by reducing power levels as a means of protecting the engine. On standard low octane fuels, power is reduced to 960 hp. In 2013, Koenigsegg presented the 2014 Agera S model. 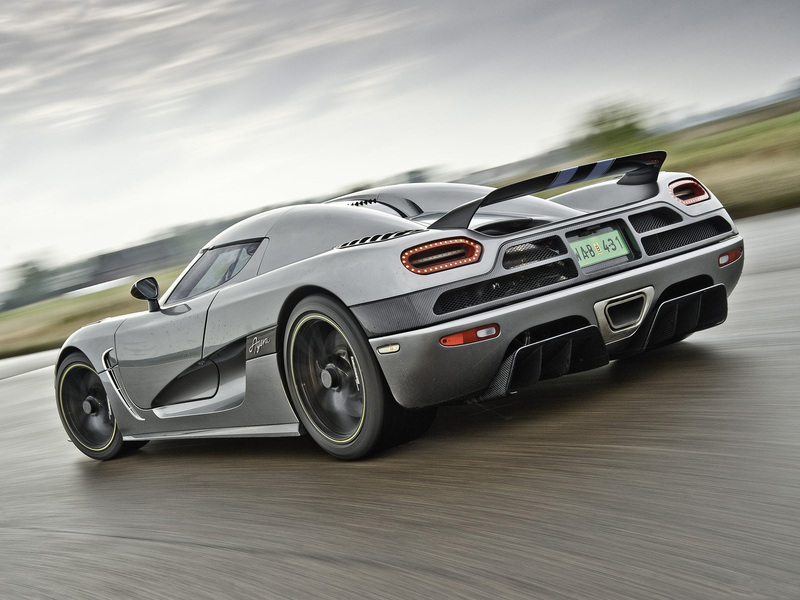 Built for markets lacking E85 biofuel, the Agera S has most of the upgrades of the Agera R compared to the normal Agera including the dynamic wing, but is optimized for running on low octane gasoline producing 1030 hp/1100 Nm compared to the 960 hp/1100 Nm of an Agera R running on the same fuel. Running on biofuel the Agera R is still more powerful, producing 1140 hp and 1200 Nm. In 2013 one Agera S was the 100th Koenigsegg ever produced, celebrated by a specially built car with gold leaf inlays named "Hundra" (Swedish for hundred). Recently, an Agera S was sold in Singapore for the price of S$5.3 million (US$4.2 million). On 10 June 2014, NAZA Swedish Motors launched the Agera S in Malaysia. It was the first Koenigsegg model to arrive in the country, thus setting a new market for Koenigsegg. It was priced at RM5 million before the tax and it was estimated that it will be priced at RM15 million with government tax and duties – making it one of the most expensive cars in the country. The Agera S is the only model offered in Malaysia due to the absence of E85 biofuel in Malaysia. The Koenigsegg One:1 was presented at the March 2014 Geneva Motor Show. Koenigsegg will build six cars apart from the car presented on the Geneva Motor Show. All the cars have already been sold. 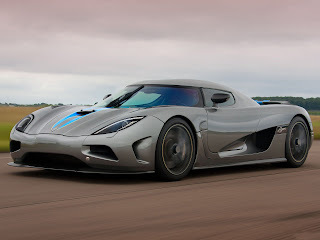 Koenigsegg brought 2 cars to the 2014 Goodwood Festival of Speed, where it was displayed alongside other supercars such as the McLaren P1, the Ferrari LaFerrari, the Porsche 918 Spyder and the Pagani Huayra. The name One:1 comes from the power (1360 PS) to weight (1360 kg) ratio giving the car 1 PS per 1 kg weight. The 1360 PS power output is the equivalent of one megawatt, which Koenigsegg is claiming makes the One:1 the ‘world’s first megacar’. The car is more focused as a track car than the previous cars made by Koenigsegg. Koenigsegg had to sacrifice a few things to be able to achieve their goal with the car. There is an airscoop on the removable roof, so it would not have been possible to stow the roof in the trunk like previous models. As such, Koenigsegg have taken advantage of this and modeled the front to create more downforce, which reduces trunk capacity by 40%. The Koenigsegg One:1 is fitted with a variant of the same 5.0-litre twin-turbocharged V8 engine used in all Ageras. It produces 1,360 PS (1,000 kW) at 7500 rpm and 1,371 Nm (1,011 lbft) of torque at 6000 rpm. Total weight of the engine is only 197 kg (434 lb) thanks to a carbon fiber intake manifold and the aluminium construction. The transmission is a 7-speed dual clutch paddle shift. Power varies between individual cars. 1 input shaft transmission with paddle-shift. Electronic differential. 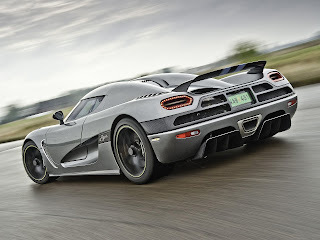 World records set on September 2, 2011 with an Agera R.
Last updated on 3 October 2014 at 17:21.